I have been working on putting together a second website to act more as a portfolio of my work for a while now. I want some thing that is not a blog to send to potential jobs, use in an “artist” profile and the like. So I started working with Wix, a free website editor to create my new site. Wix has templates for most every type of Flash based site you might want (mostly for photographers and artists). Their interface is relatively easy to use, although it can get a bit frustrating at times too when things don’t land exactly where you thought they would. Then once you have your site built Wix will host it for free (with advertising) on a domain such as www.wix.com/mywebsite. If you want it ad free and on your own domain their rates are pretty reasonable and you can upgrade to various different levels. I played around with building my site for a while but never hit the publish button. But I have been getting more offers and inquiries lately to photograph beyond just my “art” so I decided it was time to pull the trigger. 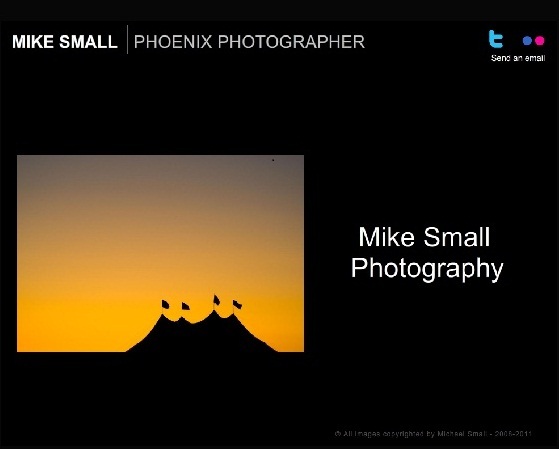 Check out version one of mikesmallphotography.com. It is still a work in process and I am tweaking things here and there. But so far I am pleased with the result and have already used it to start turning a hobby into something that could bring in some extra money. For new photography toys of course. Your new site is beautiful, mostly because your photos are there. Added it to my faves. You’re the best.